Today’s blog post marks the final day of the #TommyVCancer blog tour. We all know someone who has been affected or taken away from us by cancer. Where has the month gone! 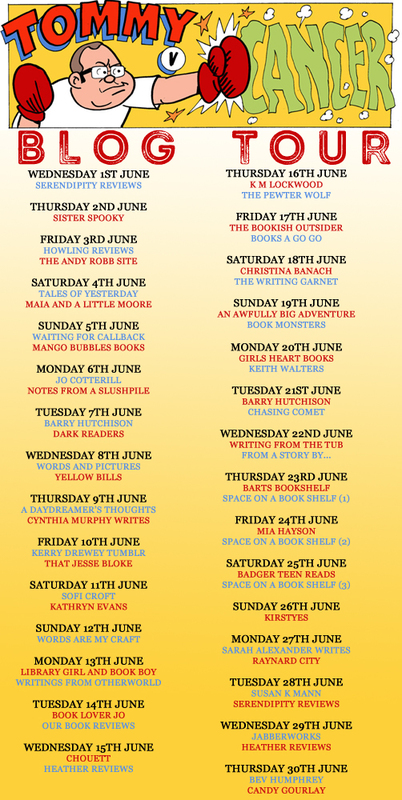 This tour has been about one authors fight against cancer and how we have tried to help by raising awareness and fundraising via the blog tour by reading Tommy’s books and hosting a chat and some fab giveaways. Today is the last day and we thought it would be good idea to do a round up blog of all the posts and to announce one final fabulous giveaway! This was a huge event to organise and the lovely Viv (Serendipity Reviews) did the most brilliant wonderful job organising along with Laura (Sister Spooky) who helped organise the giveaways and Faye ( Daydreamer’s Thoughts) who put together all of the graphics. Also thank you to Tommy’s Army who have made this blog tour something really special! As many of you will know, Tommy is still in hospital, so we are unsure if he has seen all the love he has received through social media. We can only hope we managed to raise enough awareness and hopefully some much needed funds to help in some way. We really hope Tommy is on the mend soon. To end the tour there will be a chat hosted by myself and @Serendipity_Viv tonight, 30th June from 8pm – 9pm! We will be asking questions and chatting about Tommy’s books and also announcing the winners of the giveaways (the final giveaway winner will be announced tomorrow – details below). Please join us to celebrate Tommy! So to finish off the blog tour, here are all the blog posts from the last thirty days! To finish off the wonderful blog tour properly, we have another giveaway for you! This giveway will be running for today only! Enter and spread the word. The winner will be announced tomorrow morning! We would love to raise as much money as possible for Tommy. Please help spread the word by sharing this post on twitter or Facebook or wherever you possibly can! Thank you so much for taking the time to read this post and I really hope we can make a difference for Tommy and his family. This entry was posted in Other, Tales Post and tagged Tales Post, Tommy Donbavand, TommyvCancer on June 30, 2016 by Chelley Toy. Today’s blog post is about something very special. This blog post is about one authors fight against cancer and how we are trying to help by raising awareness and fundraising via a blog tour, reading Tommy’s books and hosting a chat and some fab giveaways. 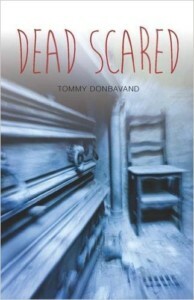 Today as part of the month long blog tour I am reviewing one of Tommy’s books – Dead Scared! First a little introduction from a recent press release…. Award-winning author and Beano writer, Tommy Donbavand, has vowed to fight back after receiving a devastating throat cancer diagnosis. The 48-year-old father of two has just launched a searingly honest blog that will chart his battle with the illness and has already received support from thousands of people around the world, including international best-selling novelist and screenwriter, Neil Gaiman. 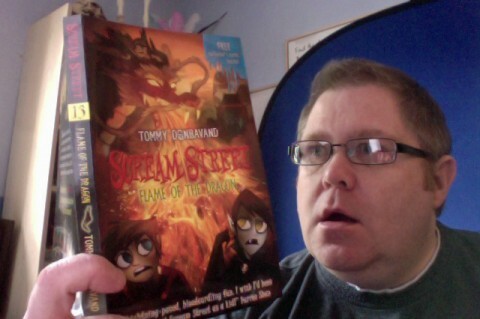 Tommy, who currently writes The Bash Street Kids for the Beano comic and is the creator of CBBC animated series Scream Street, is sharing details of his diagnosis and upcoming treatment, while laying bare his fears and worries about what the future holds. He is about to start a programme of radiotherapy that may leave him unable to talk or eat and suffering extreme pain for months. “A few people suggested I start a blog so friends and relatives could keep up with how I’m progressing,” explained Tommy, who thought the blog might also answer questions his sons, Arran (16) and Sam (9), might be worried about asking directly. Little did he expect, though, that soon thousands of internet users from all over the world would be following his updates, posting comments, and sending him emails of support. After Tommy, who grew up in Liverpool but now lives in Lancashire, wrote about how the illness and aggressive treatment plan have left his family facing financial difficulties, the site’s visitors were quick to rally to his aid. So far more than 60 people – many complete strangers – have become ‘patrons’ of Tommy via Patreon.com, sponsoring him on a monthly basis in return for exclusive written content. 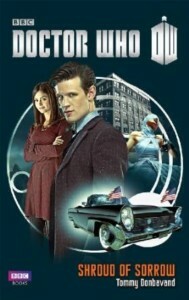 Other top authors are also getting behind Tommy, who has written several official Doctor Who comics and novels, with many offering to donate fees from their speaking events to help ease his money troubles during his months of gruelling treatment and recovery. When Toby’s mum died of cancer, he knew his life would never be the same again, but even he couldn’t guess just how much the world was about to change. When a stranger offers to bring his mum back from the dead, he jumps at the chance. All he has to do is nominate someone to take her place in the coffin. What could possibly go wrong? Source – I was sent a digital copy of this book by the wonderful Danny at Badger Publishing but since reading have purchased a few more titles for my kindle. This does not affect my review or my opinions in any way and am delighted to write an honest review. Thank you Scholastic for sending this to me to read and to Faye for organising! 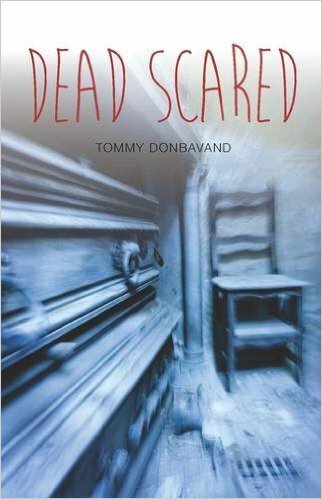 I picked Dead Scared as my read for the tour due to my love of the old Point Horror books and whilst looking through all of Tommy’s books this one jumped out at me and sounded like a similar premise. I was not disappointed. Dead Scared tells the story of Toby who has just lost his Mum to cancer and wants with all his might to bring her back from the dead. After fighting with his obnoxious Uncle at his Mum’s funeral a mysterious stranger appears offering Toby an offer he can’t refuse. What would you do if you were offered a chance to bring your Mum back from the dead in exchange for someone else? But maybe this is an offer too good to be true? I really enjoyed this book. What I loved about it was the mix of emotions, fear, humour and the feeling of your worst nightmare coming true! You sympathise with Toby because of the situation and genuinely feel for him each step of the way and with the twists and turns that occur following signing the contract. This book is very short and is aimed at reluctant readers and beyond. But even though it’s a short read it is perfectly executed and packs the punch it is intended to do to leave the reader fully satisfied. I can’t wait to read more of Tommy’s books! I loved it! Heres a selection of extra books I bought after reading Dead Silent! Follow the fab blog tour throughout the month of June! There will be giveaways, reviews, chats and more! There will be a chat hosted by myself and @Serendipity_Viv on the 30th June from 8pm – 9pm! We will be asking questions and chatting about Tommy’s books and also announcing the winner of a giveaway that will go live at 8am! We’ve got 4 big UK giveaways. 1 (roughly) each week with the 4th one being held during the live twitter chat. To enter each prize draw, your initial entry works like a raffle at the school fair. You’ll be asked to donate £1 (or more) to Tommy’s Paypal fund and then you’ll have access to a few extra free entries. The idea is to help Tommy and his family, a little, as he continues to kick cancer’s arse. The winners will be announced during the twitter chat and to claim your prize you MUST keep your paypal receipt. You’ll be asked to give proof of your donation along with your UK postal address in order to claim your prize. Prizes will be sent out by the publishers/agencies so delivery times may vary. 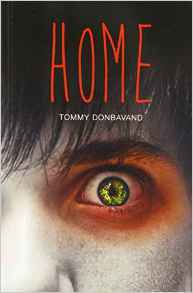 This entry was posted in Horror, UKYA, YA and tagged Blog Tour, Horror, Review, Tommy Donbavand, TommyvCancer, UKYA, YA on June 4, 2016 by Chelley Toy. This entry was posted in Other, Tales Post and tagged Tales Post, TommyvCancer on May 29, 2016 by Chelley Toy. This blog post is about one authors fight against cancer and how we are trying to help. 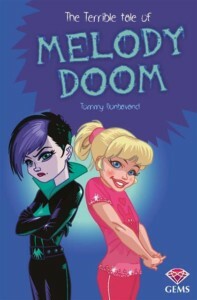 Tommy is the author of almost 100 books, including the best-selling Scream Street series, Fangs: Vampire Spy and several novels for dyslexic and struggling teenage readers. 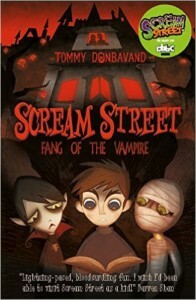 Scream Street was recently adapted into a hit CBBC stop-motion animation series. 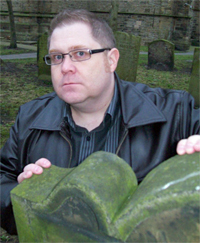 Tommy has appeared at top literary festivals and has performed events for tens of thousands of children in schools across the country over the years. His first book, the non-fiction title, Quick Fixes For Bored Kids, was published in 2001. He is currently working on several new books, despite undergoing treatment. Before becoming an author Tommy performed in the West End production of Buddy – The Buddy Holly Story for several years, becoming the show’s longest-serving cast member. Both his parents were victims of cancer, so Tommy has personal experience of the daunting challenges he faces. We are organising a blog tour to help raise awareness of Tommy’s fight against cancer. The #TommyVCancer blog tour will start on the 1st June 2016 and run till the end of the month. We hope to help raise money for Tommy to support him during this difficult time. We are looking for as many authors and book bloggers as possible to take part in the #TommyvCancer Blog Tour. Every one involved will review a book written by Tommy, as well as including information on how they can help support Tommy. You can find more information on how we can support Tommy below. Anyone wishing to be involved in the blog tour should contact the lovely Viv at vivienne_dacosta@hotmail.com who will collate all the requests, working with Faye Rogers to organise a plan for the tour. Please feel free to email about any other ways we can fund raise for Tommy and his family also. This entry was posted in Spotlight and tagged Spotlight, TommyvCancer on April 24, 2016 by Chelley Toy.